Name: Frobisher (Real Name Avan Tarklu). Format: Comic, Book and Audio. Appearances: "The Shape-Shifter" - "Funhouse", "Mission: Impractical", "The Holy Terror" and "The Maltese Penguin". Doctor: Sixth Doctor and Seventh Doctor. History: Shape-shifter companion Frobisher - the sentient penguin - first appeared in Issue 88 of Doctor Who Magazine and travelled with both the Sixth and Seventh Doctors. He was a regular in the comic strips until he was written off in issue 133. Frobisher's appearance in the Marvel's strips started in the gap between seasons 21 and 22; Peri was reintroduced starting with issue 104. 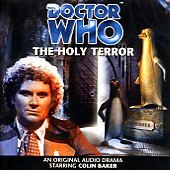 Frobisher was also featured in the BBC novel "Mission: Impractical" and the audio stories "The Holy Terror" and "The Maltese Penguin". Both are set between the TV stories "The Trial of a Time Lord" and "Time and the Rani". If these new adventures are to be considered cannon, we should assume that all the strips from the introduction of Frobisher to the end of 'Funhouse' - in fact those before the coming back of Peri - should be also be part of the continuity. The subsequent strips featuring a returning Peri after her exit in "The Trial of a Time Lord" are obviously not, especially if her return in the Seventh Doctor and Chris New Adventure "Bad Therapy" is to be counted as genuine. 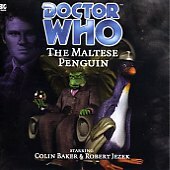 To begin at The Doctor and Frobisher's first meeting, Frobisher - then known as Avon Tarklu - was originally a Private Eye from some time in the far future, initially working with his wife Francine before she left as he was mainly interested in conning money and she was a more efficient detective ("The Maltese Penguin"). Despite this, Tarklu was hired by a man named Dogbolter to track down the Fifth or Sixth Doctors, suggesting that he was acquainted only with those two Doctors. However, Tarklu decided not to hunt The Doctor after tracking him to the TARDIS as he concluded that he liked the Time Lord, the two of them tricking Dogbolter into giving them the money for The Doctor's capture before they left. To stay safe, The Doctor and Tarklu were forced to run from Dogbolter, preferably to some far distant dimension, Tarklu changing his name to Frobisher as he felt it was suitably British to appeal to The Doctor. Frobisher's exact species is a Whifferdill, a shape shifter that can become anything they want. They are some of the most efficient shifters known, especially since they don't have to shift to their natural state in between changes. Frobisher constantly maintains the shape of a penguin because he finds it relaxing, and took the name of Frobisher because the personality he made for that name had fewer problems than his Avan Tarklu persona. Since he began to travel with The Doctor, he has only ever taken on his original shape once, when escaping pursuing law enforcement officials ("Mission: Impractical"), finding his penguin disguise more relaxing even on such trips as him and The Doctor attending the Star Wars premiere in 1977. Despite spending a lot of time as a penguin, Frobisher still uses his shape shifting-ability, although more sensibly than before - he once became a till checkout for fourteen years simply to be close to the girl who worked there. Since joining The Doctor, he has been using his abilities for disguise and infiltration purposes, such as when he became The Doctor's coat during "Mission: Impractical", to look around a location they had to rob to save two planets. Although willing to kill Dogbolter's guards when threatened, Frobisher also possesses The Doctor's high esteem for life, having once changed his beak shape when he was appointed God of a castle ("The Holy Terror") and a sculptor was nearly executed for making a mistake. He's also very attached to The Doctor, and actually hugged him when The Doctor had been apparently killed by an electric shock, but had really put himself into temporary stasis to get some bounty hunters off his tracks ("Mission: Impractical"). Frobisher's time with The Doctor was definitely more difficult than his time as a Private Eye, when he mainly handled small crimes and some divorces, but he still enjoyed it since it was for the adventures he has with The Doctor that Frobisher became a PI in the first place, even if he recognised that he was better suited to finding lost cats on his own. He prides himself on maintaining a sense of scale about the world, and always buys whatever approximates to a newspaper whenever he and The Doctor land somewhere. His shape-shifting abilities were later lost when he contracted the shape-shifting disease mono-morphia and was trapped in the form of a penguin, but it had little real impact on his relationship with The Doctor or his travels in the TARDIS. He spent some time away from The Doctor to restart his private detective career when he became tired of being the sidekick after he got over his illness, but returned to The Doctor as he felt that he could do more with his friend after proving himself on a case against their old foe Dogbolter ("The Maltese Penguin"). Frobisher has helped The Doctor deal with several problems in his time - on only his second adventure with The Doctor, the two of them battled the legendary Thief of Time, apparently a Time Lord from the old days who stole one of Rassilon's sacred texts and used them to steal artefacts from planet's past ages. He also met up with The Doctor's old enemy Astrolabus, a Time Lords on his thirteenth life, who briefly held him captive in a cabinet of some sort that created illusionary worlds. The Doctor and Frobisher managed to defeat Astrolabus, but he accidentally got taken to the dimension of Death. In his last 'continuity' comic appearance, he and The Doctor were trapped by an alien entity that took on the form of a haunted house and tried to leech off The Doctor and Frobisher's worst fears. The Doctor barely managed to cast the creature out of the TARDIS by destabilising Time inside the TARDIS, and even that caused Frobisher to become a small embryo of fluid and The Doctor to revert into the First Doctor. The Doctor's keen appreciation of Frobisher's skills remained long after they parted company and The Doctor regenerated; when future Doctors learned that a mysterious figure was hunting their past companions throughout his history, the Tenth Doctor contacted Frobisher as part of a plan to put his enemy off-guard. Having received the future Doctor's message, Frobisher assumed the form of Peri and allowed their foe to capture him so that the unknown adversary would assume that he would be easier to trap than he actually was, Frobisher escaping his prison and rescuing his fellow companions when the eleven Doctors arrived to save their friends as their adversary prepared to kill them all ("Prisoners of Time"). If we assume that only the above adventures can be counted as actual Who continuity, the specific circumstances of Frobisher's departure of the TARDIS are unknown; in the comics, he left while travelling with the Seventh Doctor to stay on a luxury planet as he felt dissatisfied with the TARDIS since Peri's departure, but this version of events is obviously irreconcilable with Peri's actual fate and the fact that Frobisher was absent from the Sixth Doctor's life for some time before he regenerated and was never shown with the Seventh Doctor at any other point. The most likely assumption is that Frobisher simply decided that he had spent enough time with The Doctor and decided that he was ready to strike out on his own once more. One comic depicted him running a bar in human form while calling himself 'Bish' during a later meeting with the Eighth Doctor, although neither recognised each other due to The Doctor's regenerations and Frobisher's new appearance since their last meeting.